Commemorative tablet to Chris Gueffroy. In the background is the partly destroyed Wall, near Reichstag. Winter 1989/90. 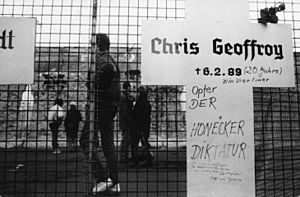 Chris Gueffroy (21 June 1968–6 February 1989) was the last person to die while trying to escape across the Berlin Wall. Gueffroy and his friend Christian Gaudian tried to escape from East Berlin to West Berlin on the night of 5 to 6 February 1989. They tried to cross near the Britz district canal. Gueffroy and Gaudian thought that the Schießbefehl, the order to shoot anyone who attempted to cross the wall, had been stopped. Climbing the last metal fence, the two were seen and shot at by the National People's Army (NVA) border troops. Gueffroy was hit in the chest by ten shots and died in the border strip. Gaudian was badly injured, and was arrested and was sentenced on 24 May 1989 to imprisonment for three years by the Pankow district court for trying illegally to cross the border ("versuchten ungesetzlichen Grenzübertritts im schweren Fall"). In September 1989 Gaudian was freed on bail by the East German government and on 17 October 1989 he was transferred to West Berlin. The four border guards at first got an award (Leistungsabzeichen der Grenztruppen) from the chief of the local border guards, Erich Wöllner, and a prize of 150 East German Marks each. After the reunification of East and West Germany, they were prosecuted by Berlin regional court. Two of them were released in January 1992. Ingo Heinrich, who fired the shot that killed Gueffroey was sentenced to three and a half years in jail. The Bundesgerichtshof reduced the penalty to a suspended sentence of two years in 1994. In 2000, two SED officials, Siegfried Lorenz and Hans-Joachim Böhme, were tried for the death of Gueffroy and two other young men, but acquitted as the judge could find no evidence that they might have been able to lift the shoot-to-kill order. The case was retried on 7 August 2004, and the two men were found guilty and given suspended sentences of 15 months each. The judge explained that the short sentences were due to the length of time since the events. This was the last case concerning deaths on the inner German border. 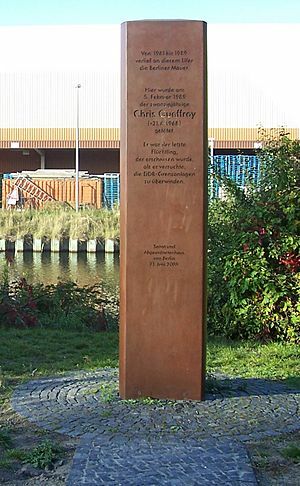 On 21 June 2003, which would have been his 35th birthday, a monument to Gueffroy was built on the banks of the Britz district canal. The monument was designed by Berlin artist Karl Biedermann. Chris Gueffroy Facts for Kids. Kiddle Encyclopedia.